WESH 2 Share Your Christmas Food Drive from Gatorland – UPDATE! 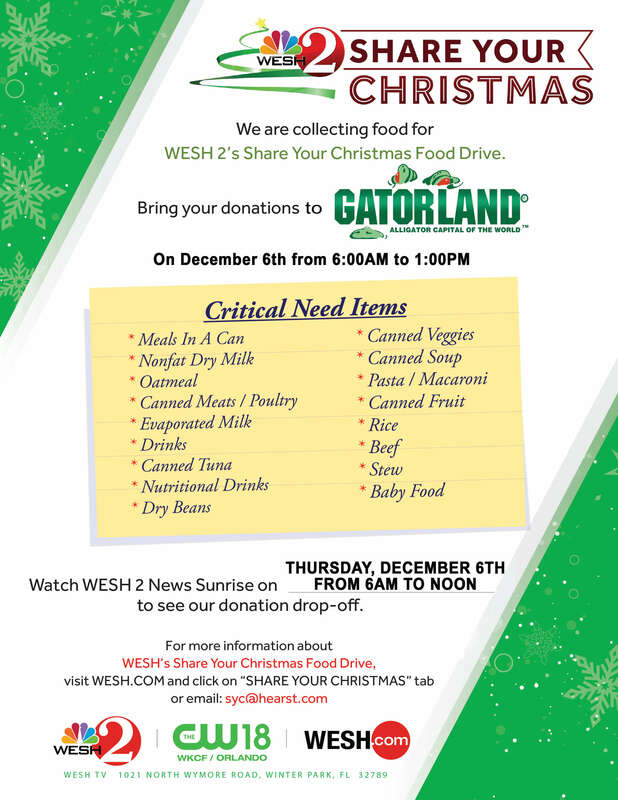 Gatorland would like to thank all those who stopped by on December 6th to donate towards the WESH 2 News – Share Your Christmas Food Drive. Over 4,689 pounds of food was collected in addition to cash donations of $ 673.00, and a donation from Gatorland of $10,000.00. This year is the 33rd year of Share Your Christmas, and the best year yet! Gatorland®, the “Alligator Capital of the World,” is proud to announce it has partnered again with WESH 2 News for the 33rdAnnual Share Your Christmas Food Drive benefiting the Second Harvest Food Bank. On Thursday, Dec. 6, between 6 a.m. and 1 p.m., the public is invited to stop by to drop off their food donations while WESH 2 TV News anchors broadcast live on location and do meet and greets until Gatorland makes its big check presentation to Second Harvest Food Bank live during the noon newscast. Guests to Gatorland can begin dropping off their food donations at the park any day from November 30th through Dec. 6, if they are unable to do so on the big d day. Those bringing a food donation to Gatorland will receive one entry into a drawing for a VIP Tour of Gatorland for 4 people featuring the Screamin’ GatorZipline, the Stompin’ Gator Off-road Adventure, an Adventure Hour Experience, Tortoise Feeding and an exclusive up close and personal visit with a White Alligator, plus much more. Stop by at Gatorland on Thursday, December 6th from 6AM to 1PM with your donation! Additional information may be found on the WESH website including lesson plans for teachers and parents so children in Central Florida can learn about the need for donations.